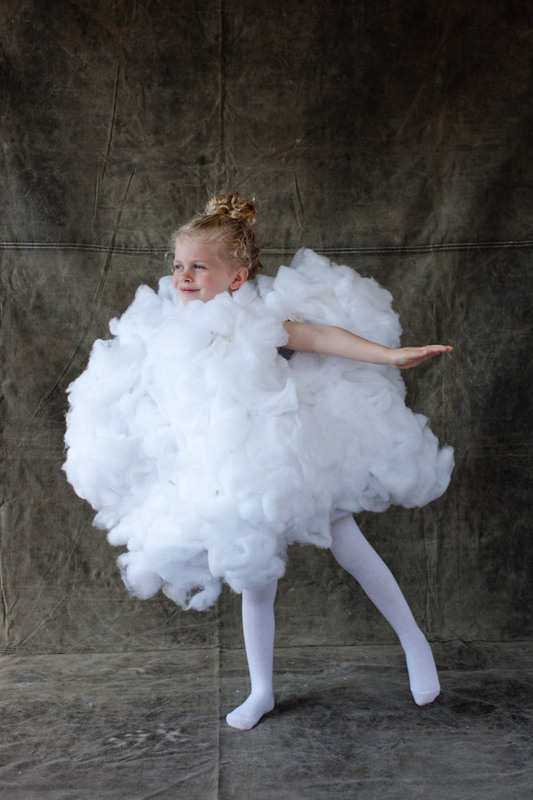 Today we are sharing one of my favorite costumes, this sweet little cloud. This costume was really fun to make and would work amazing for an adult costume too. I love working with paper mache (it reminds me of making pinatas!) because you make something with structure out of flour, paper, and water. Plus it is fun to work with your hands and get a little messy. 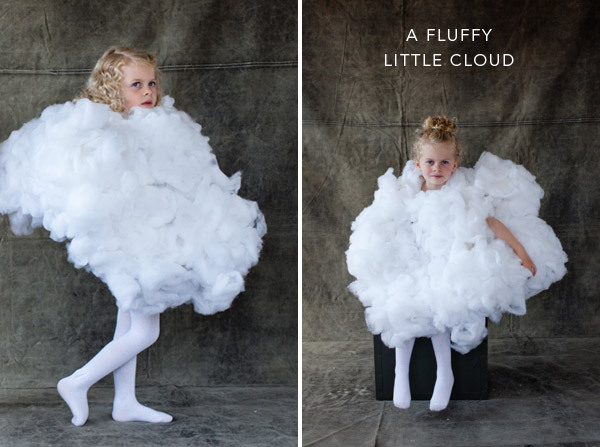 Find the tips below for making a cloud costume of your own. Step 1: To make the cloud structure we followed this tutorial here. (I think their pillow stuffing looks more cloud-ey than batting, but use what you have.) Leave a generous hole at the bottom for the feet to come out, ours was kind of like a skirt. Thanks to A for showing us her ballet skills! Thank you for sharing! I am terribly uncreative when it comes to crafting (and making Halloween costumes falls into the crafting category for me). This is so cute. We’re thinking of having one of our boys be a cloud and one be rain. So, I’ll let you know what I come up with for rain. 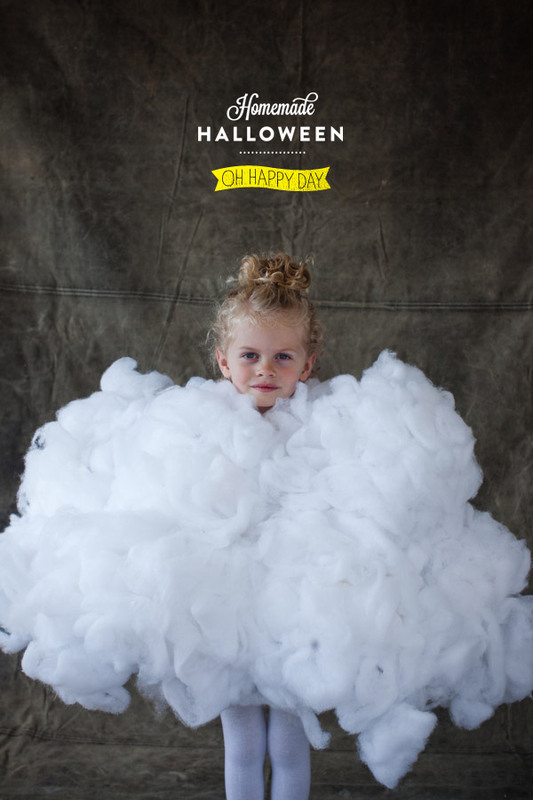 This is adorable, and I love the idea of the cloud/rain combo… but I’m going to be a debbie downer on this one… On a how to make costumes site I read this terrible story of a man whose sheep costume (many cottonballs on a jacket) caught fire at a party. He was burned on hands and legs and only the quick thinking of his friends kept it from getting worse. There is always a safe and an unsafe way to do things…. I love homemade costumes, but will be thinking this year about fire and tripping safety. Oh gosh, that’s really cute! Haha. oh, that is one sweet, sweet smile on your happy cloud. Being 6 months pregnant and rather round, i think i just found my halloween costume. thank you! I bought my 20 month old a costume, but he is NOT liking wearing it yet. Sigh. Maybe next year I’ll let him pick a costume! Too cute!!! As a gal in my early 20’s I feel obligated to wear a skimpy costume but I’d much rather be a cloud :). Ha! this is too cute! One of my friends did something similar last year for their pet only they were a snow ball. I’m really loving this series! These are so stinkin cute!! Love this new series! Oh my gosh you are posting the cutest costumes ever! Way to put a smile on my face. This is BEYOND adorable, thanks for sharing! This turned out so cute. I was just thinking it would be cute with vellum raindrops hanging below, or even gold or silver pants to look like lightning! As for the fire hazard…aren’t most Halloween costumes a fire hazard? Maybe worried parents should carry a small fire extinguisher. I love creative costumes and this is so cute! So adorable! The little girl couldn’t look sweeter! Again going to repeat what someone said above, super cute idea but super dangerous!! Think about how many candles are out on Halloween night in pumpkins, paper bags and milk jugs. This costume is very flammable and could seriously injure a young child. See article bellow of a man who knows first hand the dangers of “fluffy” homemade costumes. You could take this one step further and make her a rain cloud. A friend of ours spray painted it black, added an ipod with speakers and downloaded the sound of thunder. They painted the face black and her son worn a black cap. It was genius. 20 DIY Costumes For Babies, Kids, And The Whole Family!